Near Pins: Geoff Parker, Neil Carter, Paul Bannister. Pattaya awoke to torrential early morning rain, which abated to a steady drizzle by muster time at the M-Club. Eight hardy souls decided to brave the conditions and traveled to Mountain Shadow course to find it empty but the drizzle stubbornly persisting. The rain stayed to almost the end of the first nine when it cleared and gave way to overcast skies and humid conditions. Despite the rain, the course was in fine condition with the exception of the greens which were surprisingly slow. A further challenge emerged as we found the course dogs had dug some large holes in some of the greens, particularly the par-three eighth where a hole and mound of earth was situated within one foot of the pin. Overall scoring was poor with only one golfer equaling par. One near pin went unclaimed. Near Pins: Brett Chan, Paul Bannister. Jimmy Carr, Geoff Parker. Eleven Bunker Boys set off to Pattaya Country Club under grey, threatening skies. By the time we reached Parrott Village the grey gave way to black and torrential rain tumbled down accompanied by thunder and lightning. After a forty minute delay, where coffee and conversation were the order of the day, a break in the weather appeared on the horizon and we assembled on the first tee under a very light drizzle, which persisted for a few holes before giving way to clear skies and bright sunshine although very humid. The course benefited greatly from the rain and looked green and lush. The greens were recently cored and only sanded on the back-nine making putting a real challenge. Often we saw a players ball jump on the greens, which made putting a bit of a lottery. Despite all this, scoring was of a high standard with Brett Chan taking the ‘chocolates’ with a well compiled forty points (twenty-two) on the back and beating Michael Brett into second place on count back, also on forty points but with twenty-one on the back. Four different players won a near pin. Our number was reduced to ten on the back when PJ had to withdraw with a reoccurrence of a back injury, hopefully not too serious and we hope to see him back on the course shortly. 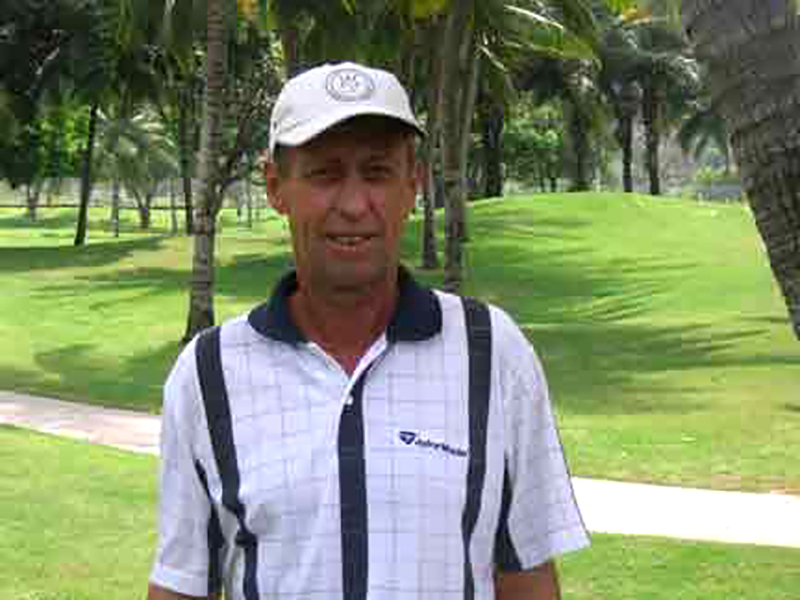 The race for “Golfer of the Month” looked likely to be a shootout on Friday between Neil Carter and Geoff Parker. Near Pins: Jimmy Carr, Neil Carter (2). A mix of inducements and bribes were used to lure eleven Bunker Boys to the Parichat course for the last game of the month using the rainbow format. Inducements from the course came in the form of an 800 baht green and caddie fee (walking) and 1,400 baht with cart, which is good value. In addition, Tony Robbins generously supplied a bag of free balls to be shared out amongst those willing to take up the challenge and not having to risk losing all their own good balls. It has to be said the course was in the best condition of any we play; tee boxes were better than greens at many courses, fairways were well grassed and mown tight and the greens ran true. However, numerous hidden obstacles lay in wait throughout the course, in many cases, these obstacles could not be seen from the normal playing position and players with prior knowledge of the course were at a distinct advantage. This also applied to the rainbow format as again prior course knowledge was invaluable with correct tee selection. Being the last game of the month it was also time to find out the winner of “Golfer of the Month” and Geoff Parker, who was leader of the field, threw down the gauntlet early by parring the first four holes and effectively saying to the chasers “catch me if you can”. None did and Geoff won with daylight between himself and second place. He also carried the day with a well compiled thirty-six points. It has been suggested that with the current favourable course fees that we make this a monthly fixture. 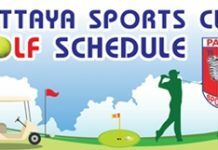 The suggestion has merit as the course is very convenient to Pattaya, in very good condition, and good value, particularly for those prepared to walk and it certainly offsets the cost of lost balls.